hesitant to do because we are afraid of failing. Let us remember that the caterpillar was about to give up when it turned into a butterfly. Life without play is dull, without service it is meaningless. Amen! Thank you to all who came to lunch today. 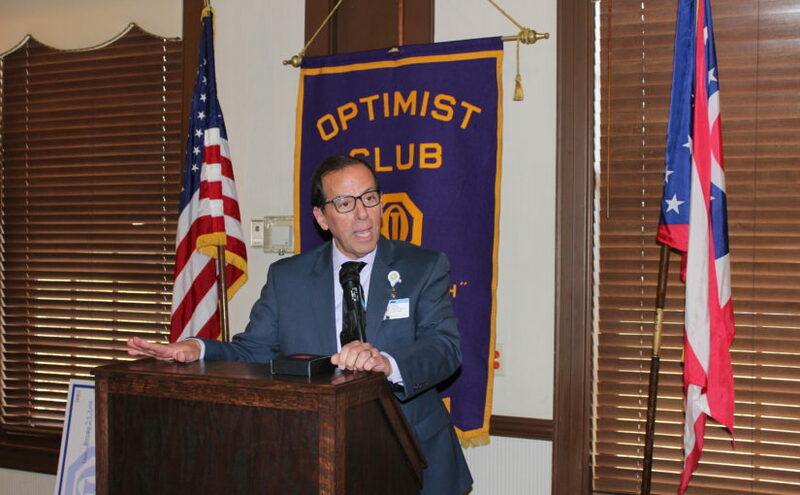 Despite the massive U.S. government shutdown, optimism triumphed and we still had a successful Centerville Noon Optimist meeting. We were even able to overcome not having official 50/50 raffle tickets. A fine for the missing tickets is pretty much guaranteed. We had multiple speakers and topics today. Our own Don Kelley discussed the long-range planning committee’s plans for celebrating our club’s 50th anniversary. The celebration includes the following. 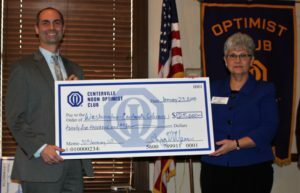 Library director, Kim Senft-Paras, accepted the check for the Washington-Centerville public library. She explained this donation allowed the library to add back their plans at the new Woodbourne library for an outdoor children’s garden with shade structures. The children’s garden was originally cut due to budget constraints. 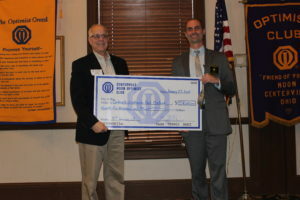 Executive director, Arnie Biondo, accepted the check for the Centerville-Washington Park District. He explained this donation will be used to build a new playground area at Forest Field park and include a nature area. It will use the latest materials and designs to make it safer and very accessible for kids with special needs. Our next speaker was, Dr. Ramey PhD, a pediatric psychologist and the executive director for the Center for Pediatric Mental Health Resources at Dayton Children’s. He has been at Children’s for 38 years. One in 3 kids has a major mental health problem at some point in their childhood. We need to do more earlier for mental health to help raise kids into adults that are caring and moral. Over the past 25 years there has been a 33% increase in issues caused by the need for perfection as a child. This shows up as anxiety, depression, or suicide attempts. There has been an additional noticeable rise in issues related to Social Media. Social Media should not be demonized, we have to find a way to help children and adults to manage social media experiences because they are not going away. In our area 8.6 percent of kids have attempted or seriously contemplated suicide. We need mental help to be easily accessible. Ramey says Children’s is working on it. Children’s hospital now will have 3 psychologists and 13 psychiatrists to help kids. In a year Children’s will open up a new 24 bed crisis center. This should eliminate the need for Children’s on a regular basis to find an appropriate facility somewhere in the state to accept children in need. Cherie Gentry Snitching to the Sergeants about Tim Clemmer being absent too often when he was a Sergeant. Carrie Million Telling her sister Marge Back that she could not find her badge even though it was in the right place. Bill DeFries Just now bringing a good friend as a guest that he has known for 20 years. Bill Stone Kelly Stone’s minor ear surgery went well. Julie Noeth Will have 1st grandchild beginning of July 2018. Myron Rheaume Thanks everyone in the club for what we do.